DJ: Welcome welcome welcome to Feel Me Flow! In today’s show, we are celebrating World Press Freedom Day! The UN General Assembly declared May 3rd “World Press Freedom Day” to raise awareness of the importance of freedom of the press and remind governments of their duty to respect and uphold the right to freedom of expression. In the hyper-informational age we live in, facts are falling between too many cracks. With press freedom comes press responsibility, and it sure seems that certain organizations aren’t reporting responsibly. However, that is what freedom is. So today we will play what we want because we want to play it. It’s time to get random! Behind us, Small Faces are playing “Ogden’s Nut Gone Flake” from their 3rd LP of the same name in 1968. They had a big hit with “Itchycoo Park” in 1967, though would eventually split and evolve into Faces after adding Rod Stewart and Ronnie Wood. Faces’ hit “Ooh La La” would go on to appear in many movies and TV shows like Rushmore and Without A Paddle. Let’s kick it off with The Black Keys doing “Set You Free”, not to be confused with The Kinks track “Set Me Free”. The two do sound a bit similar though. Coincidence? DJ: Won’t you tell me? Where have all the good times gone? Who doesn’t wonder that at some point in their lives? The Kinks doing “Where Have All The Good Times Gone” off of The Kink Kontroversy from 1965. Sleater-Kinney would later pay homage to the Kontroversy artwork on their 3rd album Dig Me Out. Before that, we heard the 90’s alternative group Elastica sampling Wire’s “Three Girl Rhumba”. Elastica and Wire settled out of court and Elastica rewrote song credits after Wire put up a fuss about the sampling without their permission; deservedly so. Stop stealing, guys. Speaking of Wire, they played “Ex Lion Tamer” before their samplers arrived. Henry Rollins covered this track on his first solo effort, 1987’s Drive By Shooting (credited as Henrietta Collins And The Wifebeating Childhaters). Henry would release Hot Animal Machine later that year featuring a cover of Richard Berry’s “Crazy Lover”. Gang Of Four, another new wave punk band from the late 70’s, gave us “Damaged Goods” from their acclaimed album Entertainment! 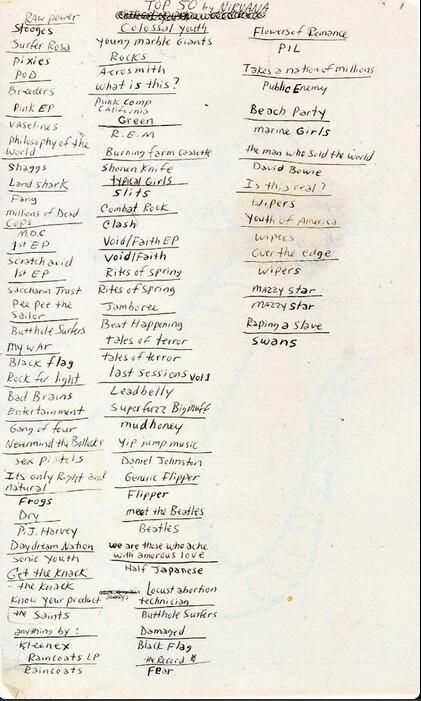 Kurt Cobain listed Entertainment! in his “Top 50 by Nirvana” album list. Look for that list and more Nirvana to be featured next week when we celebrate Krist Novoselic’s birthday! The Black Keys led the set with “Set You Free” from their 2003 album Thickfreakness. The album was the first for their new label Fat Possum Records. Dan Auerbach and Patrick Carney spent the small advance payment from Fat Possum Records on rent and subsequently most of the album was recorded in a single 14-hour session in Patrick’s basement using an early 1980s Tascam 388 8-track recorder. Thickfreakness also featured a Richard Berry cover, this time of “Have Love Will Travel”. DJ: That’s “Sick As A Dog” from the 2016 Hamilton Leithauser and Rostam Batmanglij collaboration I Had A Dream That You Were Mine. I think it’s one of 2016’s best albums, expect more cuts from it in the future. Hamilton hails from The Walkmen and Rostam is originally from Vampire Weekend. Ty Segall and “Girlfriend” crunched through the set prior to Hamilton + Rostam. Ty’s album Melted is currently listed as one of the essential albums of the Garage Rock subreddit on Reddit.com along with Jay Reatard’s Blood Visions, The Sonics’ Here Are The Sonics, The 13th Floor Elevators’ The Psychedelic sounds of The 13th Floor Elevators, Black Lips’ Good Bad Not Evil, and The Stooges’ Raw Power. Beck gave us a cover of a Blonde On Blonde-era Dylan tune, “Leopard-Skin Pill-Box Hat” from the War Child Presents: Heroes charity album. Lots of great covers on that album; including an epic TV On The Radio version of “Heroes” and a perfect rendition of The Band’s version of “Atlantic City” by The Hold Steady. George McCrae continued Traffic’s vibe with “I Get Lifted” from his 1974 debut Rock Your Baby. The song’s beat would be sampled for Snoop Dogg’s “Gin & Juice” in the early 90s, and even make its way onto the Grand Theft Auto soundtrack. DJ: The Romantics doing a song I used to hear at every single wedding and baseball game as a kid. “What I Like About You” is about as catchy as rock gets. Before The Romantics was wordsmith Elvis Costello doing “Radio, Radio”. Elvis famously played the song on Saturday Night Live in 1977 after beginning to play “Less Than Zero”. He stopped the band and decided this was a more appropriate tune. SNL banned Elvis for the move, however, lifted it just 12 years later. Speaking of TV performances, when The Who played “My Generation” on The Smothers Brothers Comedy Hour in 1967, Keith Moon hid explosives in the drum-kit and ignited them after the song had finished when everyone was smashing their instruments. Pete Townshend credits this explosion with furthering his famous hearing loss later in life. Strand Of Oaks got sentimental in “Goshen ’97” from the 2014 release Heal. Timothy Showalter, the man behind Strand Of Oaks, suffered a concussion and broken ribs in a car crash on Christmas day 2013 during the recording of Heal. Seems like a great album titled after such an event. DJ: Jimmy Lindsey made his music career debut when he began recording lo-fi garage punk in his bedroom at 15 in 1995. Under the pseudonym Reatards, he released Teenage Hate in 1998. Then going by Jay Reatard, he released a plethora of garage punk in many different bands, before releasing solo material himself. Jay died of a cocaine/alcohol OD in January of 2010. Richard Hell left the band Television to start his own work, eventually landing with The Voidoids. Hell is credited as being the first punk to spike his hair and wear safety pins, and his “Blank Generation” has been an anthem since punk’s early days. New from Benjamin Booker, we heard “Witness” from Booker’s sophomore effort of the same name due for release on June 2nd. Mavis Staples of The Staples Singers provided choral help throughout the track. Clarence Carter and the Muscle Shoals sound pounded out “You Can’t Miss What You Can’t Measure” from 1969’s Testifyin’. We can never get enough Clarence here at FMF. At the top of the set was Dutch neo-psychedelic musician Jacco Gardner. Jacco has released two full-length albums, both equally psychedelic. If you enjoyed the song, check out his catalog sometime. DJ: “Let’s Talk About Girls” from The Chocolate Watchband finalized that set. The Chocolate Watchband was another psych-garage rock 60’s band that faded out once the 70’s came along. However, they reunited in ’99 and released an album of new material in 2000! Their debut LP No Way Out was released in 1967, of course. Before that, we heard The dB’s doing “Black And White” from their 1981 debut Stands For Decibels. The dB’s got their start after singer Chris Stamey, who briefly played bass with Alex Chilton (The Box Tops, Big Star), joined up with fellow Winston-Salem guitarist Peter Holsapple in 1978. Before hearing The dB’s, Marc Bolan and T. Rex (formerly Tyrannosaurus Rex) gave us a non-album single with “20th Century Boy”. The Replacements would cover the song during the Let It Be sessions. Paul Westerberg of The Replacements has proclaimed is admiration for Alex Chilton many times, even going so far as titling a song after him (we’ll get to that in a bit). The New York Dolls were heavily influenced by Marc Bolan’s androgynous glam look and took it to another level with their drag punk style. We heard one of their more known songs “Personality Crisis” off of their 1973 eponymous debut. Leading off the set was Otis Redding and Carla Thomas doing “Tramp” from their 1967 release King & Queen. The Mohawks would cover it a couple years later and re-title it to “The Champ”. The Mohawks’ version would go one to become one of hip-hop’s most famous samples. Let’s kick off our final set with a cover by Dum Dum Girls of The Smiths song “There Is A Light That Never Goes Out”. DJ: Dum Dum Girls lead singer Dee Dee sites anyone from Madonna to The Stone Roses as her influences. It’s obvious she’s a little into The Smiths as well! After Dee Dee, we heard St. Paul, Minnesota band The Persian Leaps with “The Weather” from 2016’s Your City, Underwater. Did you know that Persians are an ethnic group that make up over half the population of modern-day Iran? Speaking of Iran, we heard I Ran (So Far Away) from A Flock Of Seagulls’ debut eponymous 1982 LP. The song was synonymous with Grand Theft Auto: Vice City in the early 2000’s after the game used it as its theme song for their promos. The band even re-released a best-of using the GTA aesthetic for artwork. Pennsylvania indie band Seagulls did a beautiful cover of Big Star’s “Thirteen”. Alex Chilton formed Big Star after The Box Tops broke up in 1970. After Big Star broke up, Alex bounced around throughout the late 70’s and 80’s until resurfacing when The Bangles covered September Gurls from Big Star’s record Radio City. After enjoying a little bit of the money that came in from royalties, Alex ended up on The Replacements’ Pleased To Meet Me playing guitar on their hit “Can’t Hardly Wait” the following year (1987). Oh yeah, and then they named a song after him. Go figure. That’s it for this episode of Feel Me Flow. Tune in next time for our Cinco De Mayo fiesta! Check out our List for all of the releases featured!